Published monthly as an official publication of the Grand Encampment of Knights Templar of the United States of America. Lawrence E. Tucker Grand Recorder Grand Encampment Office 5909 West Loop South, Suite 495 Bellaire, TX 77401-2402 Phone: (713) 349-8700 Fax: (713) 349-8710 E-mail: larry@gektusa.org Magazine materials and correspondence to the editor should be sent in electronic form to the managing editor whose contact information is shown below. Materials and correspondence concerning the Grand Commandery state supplements should be sent to the respective supplement editor. Cover photo of gargoyle and grotesque on Notre Dame Cathedral in Paris, France was taken by Sir Knight Rich Filippi. Registration for the 2019 IN THE FOOTSTEPS OF JESUS PILGRIMAGE is officially closed. We have reached our limit of fifty participants. We already have several people on a waiting list. Looking ahead, do consider these two upcoming options: KNIGHT TEMPLAR HOLY LAND PILGRIMAGE FOR SENIORS 2020 (and those with mild mobility issues) This pilgrimage is designed for those who may not be able to handle the aggressive itinerary of the "Footsteps" pilgrimage. The schedule is modified to involve not as much walking and climbing (although there is still some). The SENIORS pilgrimage is also open to Sir Knights, their ladies, friends, and guests. Each person is responsible for his own fees and expenses related to the pilgrimage. We are not able to accommodate significant mobility issues or wheelchairs. The KNIGHTS TEMPLAR HOLY LAND PILGRIMAGE FOR SENIORS is scheduled in midNovember on every fourth even numbered year or more often if interest warrants. The tentative dates for 2020 are November 9 â&#x20AC;&#x201C; 19, 2020. Please access the Knights Templar Holy Land Pilgrimage website available through the Grand Encampment site (http://www.knightstemplar.org) for further information on deposits, itinerary, and registration forms. IN THE FOOTSTEPS OF JESUS HOLY LAND PILGRIMAGE 2021 for Sir Knights, their ladies, friends, and guests is open to anyone. Each person is responsible for his own fees and expenses related to the pilgrimage. This pilgrimage is an eleven day program that covers as much ground as possible in the touring days (we average 5 â&#x20AC;&#x201C; 7 miles of walking many days, often uphill or up steps and on uneven surfaces). The IN THE FOOTSTEPS OF JESUS HOLY LAND PILGRIMAGE is scheduled in midNovember on each odd numbered year. Tentative dates for 2021 - November 8 - 18, 2021. Please access the Knights Templar Holy Land Pilgrimage website available through the Grand Encampment site (http://www.knightstemplar.org) for further information on deposits, itinerary, and registration forms. wo endings to the same story. If you attend Easter Vigil or an Easter sunrise service, you will likely hear the latter conclude the Gospel reading. If you attend the primary service Easter Day, the former will be the concluding words. From Luke, we end Easter Dawn with Peter at the tomb, seeing with his own eyes what he had been told. The words of Mary Magdalene were not sufficient. Peter had to know for himself. On the other hand, John’s account leaves us with the words of Mary Magdalene herself— the “apostle to the apostles”—and her announcement to the men that what Jesus had said before his death had come to fruition. For Mary, there was no doubt that it was Jesus. Yes, she first thought that the man near the tomb was the gardener, but that’s not the issue—she was grieving, perhaps crying, head downward. It was in hearing his voice that Mary came to know Jesus as the resurrected Christ (after all, faith does come by hearing the Word, as Paul tells the Romans). Perhaps this is why Peter walked away “marveling at what had happened” rather than believing what he saw—the empty tomb. Peter would not come to believe until later, inside the locked room, when the risen Christ came among the disciples and said “Peace be with you.” Hearing the voice of his Master, Peter (and the others, save Thomas) came to believe the Word. We who believe, do so because we have heard the Word proclaimed to us, just as Mary Magdalene heard the Word in the garden and the disciples heard it in the locked room. One day, we will see, but then our belief is not based on faith, but on sight. For now, our duty as followers and soldiers of Christ is to aid in the proclamation that He is risen so that others may hear the Word and believe, so they might come to have faith, which will come to fruition at that time when they—and we—come before our Creator and the King of Kings. Alleluia! He is risen indeed! each of the degrees in the Royal Arch ing this year as we continue our efforts. Chapter, Cryptic Council, and Command- This is cutting edge stuff for Minnesota. So how does Thomas Edison come ery. There is also a Quest Book for each degree. These are available to members into all of this? Mr. Edison would spend on a password protected page of the on the average of sxteen hours a day Minnesota York Rite web site. We are working while creating his inventions. encouraging the Chapter secretaries to Many times he would lock himself away assign a mentor for each new Compan- in his laboratory and not come out for ion, to utilize the Quest Books, and to go days at a time. It is reported that he through the study guides together and subsisted on apple pie and coffee while working on his projects. work at answering the questions. If Thomas Edison could invent such This study guide model serves two purposes. If the new Companion can a ground breaking item as the light understand all the questions, then he bulb while living on pie and coffee, should have a very firm grasp of all of just think what we Royal Arch Masons the knowledge of the degrees. Second, could do with some pie, some coffee, the Companion is then prepared to tack- a side of Masonic education! le the Companion Adept of the Temple course that is available from the York Sir Knight Tom Hendrickson, PGM is Rite Sovereign College. We are planCommander of Minneapolis Mountning to host a study group in the fall of ed Commandery 23 and the Grand 2018, to help our Companions navigate Recorder of the Minnesota Grand through the course while insisting that Commandery. He can be contacted at the work must be their own. Tomhendrickson@yahoo.com. More esoteric papers will be appearThe famous Newport Tower alleged by some to have been constructed by the Templars in Rhode Island during the 14th Century AD. Photo by the editor. aster sunrise service, Alexandria, Virginia—this actually happened! A car, unimpeded and using the driveway up to the George Washington National Memorial, drove through the middle of the Grand Encampment officers and attendees in the middle of the service. What if this had been a terrorist shooter, or worse, a suicide car bomber, targeting Christians? Hundreds would have been killed or injured. My personal opinion is that in the future, the officers of the Grand Encampment should contact the local police and have the area sealed off after the beginning of the march up Shooter’s Hill. This is the very least security they should provide. We do not hide the fact that we are gathering there, quite the opposite, we advertise the fact that hundreds of Templar Knights and Christians are holding an Easter sunrise service. We now hold three of these events nationwide. We not only openly advertise the events, we openly advertise the time and place of each event. I don’t know if you have noticed, but we no longer live in a safe and secure world. On Easter Sunday of 2016 in Lahore, Pakistan there was a terrorist attack with seventy people killed and approximately 300 injured during Christian worship. Threats and acts of terrorism are continually carried out globally. No one is safe in a public place or crowd. One must be constantly alert and vigilant to his surroundings. How are we as Knights Templar reacting? We openly advocate and promote the Christian religion. We openly publish our meeting locations and times, sometimes online and unsecure, for anyone to view. We sometimes openly invite the public. We blithely go about holding The Grand Encampment Easter sunrise services nationwide, the Gettysburg memorial service at the Friend to Friend Monument and on and on, with no thought of security for our Sir Knights and Ladies. E-mail is not secure, and that is the medium used by most Commanderies and Grand Commanderies to spread the word about the convening of Asylums. We supposedly (sometimes symbolically) “post a sentinel” to guard our Asylums. 1. More than half of the Commanderies under the jurisdiction of the Grand Encampment don’t have enough attendees to even post a sentinel. Once again, in my humble opinion, we should be able to have a sentinel (who may not be a Templar) who is armed well enough to protect the Sir Knights in attendance. We should be able to hire an off duty police officer or have, as a sentinel, a Sir Knight who is legally permitted to carry a firearm. 3. In the Lodge, again in my opinion, the vow is up for interpretation. Yes, there is a line that states we are not to bring anything offensive or defensive into the body of the open Lodge, but that continues with the codicil “to mar the harmony and good order thereof.” If a Brother has a legal permit to carry concealed, and no one knows he is in actuality carrying a concealed weapon, how does that mar the harmony of the Lodge? I don’t see it. 2. Surveil the outside of the building; use monitoring. a. Use outside services, increased costs to be incurred by Commanderies 3. Secure the Asylum using deadbolt locks to outer doors. Those who are late arriving cannot gain admittance unless admitted by a real sentinel. 4. Contract with an outside security agency or with off-duty law enforcement. Costs will be incurred, but may be less than that of automated surveillance. a. Use retired law enforcement personnel or a security guard. b. Use Members, Fellow Masons or Sir Knights. Sir Knight John K. March is a member of Centennial Commandery 55 in Coatesville, Pennsylvania and DeValois Commandery 16 in Vinalhaven, Maine. He is past grand commander of Pennsylvania and can be reached at travels@ptd.net. Sir Knight Harry J. Smith is a member of York-Gethsemane Commandery 21 in York, Pennsylvania and DeValois Commandery 16 in Vinalhaven, Maine. He is the eminent grand senior warden of the Grand Commandery of Pennsylvania and can be reached at smithhjktpa@gmail.com. Site in Jordan of an ancient Christian church believed to have been built over the place where Jesus was baptized. Photo by editor. A Message from the Chairman ood morning Sir Knights! The grace and mercy of our Lord Jesus Christ be with you always. I hope you are having a meaningful and spiritually rewarding Lenten season. This month we will worship and celebrate the resurrection of the son of God some 2000 years ago. He was crucified on a Calvary cross to save us from eternal damnation and rose from the grave to claim victory over death forever. It’s the basis of Templary. This was a gift to us, freely given, and something that we can in no way earn by whatever good deeds we do, but we can show our gratitude by giving of our time, talent, and treasure; living as exemplars of faith, hope, and charity. One way of showing our gratitude is by making a donation to our Knights Templar Eye Foundation. The research done by the scientists we support is unbelievable, and for us to keep doing that great work we need your continued support. With your help, I’m convinced that it won’t be long before pediatric blindness and eye disease is something that happened in days gone by. Happy Easter! He is risen. He is risen indeed! Alleluia! The space on these two pages is provided by the Knight Templar magazine to be used by the Grand Commanderies to communicate with the individual Sir Knights in their jurisdictions on a monthly basis. From time to time and for various reasons, we fail to receive any material from the editor of the state supplement for a given month. When this happens, we take the opportunity to offer you the information below. â&#x20AC;&#x201C; The Ed. Site in Jordan said to be the stone Moses struck with his rod to obtain water for the Israelites. Photo by the editor. Knights Templar Eye Foundation, Inc. How to join the Grand Commander’s or the Grand Master’s Clubs Any individual may send a check in the amount of $100 or more specified for the purpose of beginning a Grand Commander’s Club membership and made payable to the Knights Templar Eye Foundation. This initial contribution will begin your Grand Commander’s Club membership. In addition, members of the Grand Commander’s Club pledge to make annual contributions of $100 or more. Once contributions total $1,000, the individual is enrolled in the Grand Master’s Club. Membership is open to individuals only, and Commandery Credit is given for participation. Qualified Charitable Distributions Can Yield Big Tax Savings Congress has now made the qualified charitable distribution (QCD) option permanent for those who wish to make direct contributions from their IRA to charity. The tax law allows individuals age 70 ½ or older to transfer up to $100,000 a year from their IRA to a qualified charity. This distribution counts toward their required minimum distribution but isn’t added to their adjusted gross income the way a normal IRA distribution is. This can provide a tax savings of up to 40% depending upon an individual’s tax situation. The Templar “Hides Of Land” in Poland By Sir Knight James A. Marples, K.T. Mackey, M.D. and K.T., noted that “the Central Europe in Medieval days was ancient Templars had an encampment dependent upon the Knights Templar for there, and the modern Masonic Knights preserving Christianity from conquest Templar made an appearance there in and extinction. Not all holdings were exthe early 17th Century.”3 pansive tracts of land. Some were fairly The Knight Templar chapels were of- small enclaves or “Hides of land.” Howten fashioned into imposing structures ever, in another sense of the word “hide,” that looked like fortifications or fortress- the Templars saved the “hides” of themes, because the Knights could not be selves and thousands of other Christians. sure what the future would hold. Cha- The ancient Knights Templar were propels were erected for peaceful worship, hibited from hunting birds, especially although no one knew when an invading falconry, since it was regarded as a form army or band of renegades might attack. of amusement. It was also forbidden to With such uncertainty, they didn’t know hunt wild game, with one exception; the if or when an attack might come. The lion or mountain lion. It was believed chapels also served as places of abode. that “the lion comes searching for what In our current climate of the 21st Cen- he can devour,” thus Templars were pertury, with violence directed at churches mitted to hunt lions (which were usually and other houses of worship, it is easier mountain lions). The Templars were not to understand why the Templars always barred from taking hides off of a carcass wanted protection and why guards were which had been killed by another animal constantly stationed for vigilance. That or which died a natural death. Transmay have inadvertently given them a forming such hides into blankets or tentsecretive nature, but more accurately, it material was permitted and “didn’t kill a gave the Christian Knights and even pil- living creature.” If you look at the outer part of grims the vital security they needed. only stick matches as the prize. Since ancient Templars were celibate and moved around quite often, they were forbidden to marry; and also forbidden to be godfathers for the same reason. Their lives were always uncertain and transient. Forbidding a Knight to be a godfather was merely avoiding the similar awkwardness of assuming a family if tragic circumstances arose.6 While I love the grand cathedrals in major cities, especially in European cities such as Paris, Vienna, London, Prague, and Budapest, I think structures such as this simple and quaint Templar chapel give us pause, in prayerful contemplative thankfullness, to those who came before us. The builders built well, and the Knights who carefully guarded and tended huge swaths of land were good custodians of the area. In many ways, Central Europe owes much of its modern culture to the Knights. The growth of medieval and modern Christianity in central Europe literally hides in plain sight. Sir Knight James Marples is a life member of Mt. Olivet Commandery 12 in Wichita, Kansas, and currently resides in Texas. He can be contacted at rosehillks@yahoo.com or 1300 Greenbriar Drive, Longview, TX 75604. Makes The World Go ‘Round” came out in 1961 as the main theme song for a Broadway musical, Carnival, with both words and music written by Bob Merrill. The song has a catchy lilting tune in a typical waltz tempo and style. The lyrics seem like they may well intimate both romantic love and incorporeal love. opportunity to pass love on and create the ripple effect. Blessings of love will then always come back to us in some form or another. We could even stand for more love in our churches and Lodges. Egos can be a serious problem and are, in fact, the underlying cause of much conflict, both in our private and public lives. Paul touches on the matter of egos in his Love Chapter. Rose Dawn’s wise counsel for much prayer and meditation is certainly always good advice for us to follow in order to overcome self-centeredness and enrich our relationships with others. Dr. Synthia Andrews, ND, is a naturopathic physician who also does much work with and writing about spiritual energy as it relates to love. She wrote, “Through love and forgiveness comes peace.” She explained that we have “a choice between material or spiritual values. The decisions we make promote either spiritual wisdom or material power. Positive evolution for us requires that we choose love as the deeper reality.” So, Paul ends that great Love Chapter with: “And now abideth faith, hope, charity, these three, but the greatest of these is charity.” Yes, love is, indeed, still the greatest— and forever will be. Sir Knight Jeffrey L. Kuntz is past commander of Baldwin II Commandery 22 in Williamsport, Pennsylvania. He resides at 1610 Comly Road, Turbotville, PA 17772 and can be contacted at jeffkuntz5tiger@gmail.com. Includes: Battalion Cap, Shirt, Collar Brass, Brass Nameplate, Cap Badge, Orders Bar, Tie and Tie Clasp Caps, Brass & Accessories also Available Separately! used after the death of the first proph- Joseph Smith reportedly used it to transets, which corresponds with the destruc- late the Book of Mormon, while others tion of the first temple (www.jewishvir- believe it to be a conductor to translate tuallibrary.org/the-urim-and-thummim). the will of God to man, as in Fred HardMany different ideas related to the ing’s God’s Electronic Communicator. actual function of the lots, as well as the Brian Ragain is eminant commander breastplate itself, can be found with a of Lawton Commandery 18 and grand simple internet search. Some scholars warder of the Grand Commandery of believe that these stones of the breastOklahoma. He can be contacted at plate would also give instruction, just as ragainff@yahoo.com. 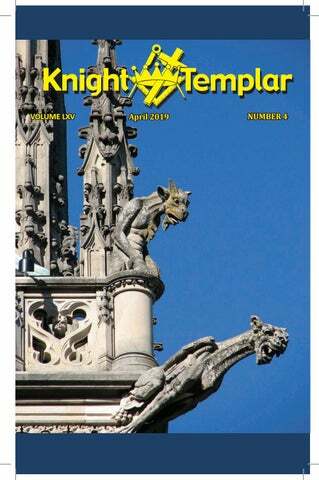 Archived issues of the Knight Templar magazine can be accessed on the web at http://www.knightstemplar.org/. Then click on the button “Knight Templar” at the bottom of the page and select “Archives.” The archives include an index. We publish letters and articles from a variety of sources and points of view. The opinions expressed in these articles do not necessarily reflect the opinions or policy of the Grand Encampment, the Knight Templar magazine, or the Editorial Review Board. Meet Our Department Commanders Sir Knight Gerald G. Pugh Right Eminent Department Commander East Central Department ir Knight Gerald G. Pugh was born in Marietta, Ohio, to Darrel and Nora Pugh on April 13, 1963. He attended Marietta High School and the Washington County Vocational School and graduated in 1981. He also attended Washington State Community College. He has been in the transportation industry for thirtyseven years and is proud of his accident free 3.1 million miles. He was the West Virginia State Police Professional Driver of the Year. He is employed by Old Dominion Freight Lines as a freight planner and inbound supervisor. He married Cheryl Sellers on May 17, 1984. Cheryl is employed by the United States Treasury Department. They have two children, son Cody Pugh of Westminster, Maryland and daughter Lindsey Pugh of Marietta, Ohio. Cody is married to Jordon Pugh, and they have given Jerry and Cheryl two beautiful grandchildren, Hailey and Allison. Jerry and Cheryl attend Sandhill United Methodist Church. He was raised a Master Mason in 1999 and was worshipful master of Aurelius Lodge 308 in 2003 and worshipful master of Harmar Lodge 390 in 2008. He is a high priest of American Union Chapter Royal Arch Masons and thrice illustrious master of Marietta Council Royal and Select Masters. He was knighted in Marietta Commandery and served as the eminent commander in 2002. He served as grand commander of Ohio in 2015. He received the KCT in 2009. Sir Knight Pugh is a 33rd Degree in the Valley of Cambridge Ancient and Accepted Scottish Rite, serving as sovereign prince and serves on the executive board. He is treasurer and past governor of Ohio Valley York Rite College, receiving the Order of the Purple Cross in 2014, a member of Ohio Priory 18, an officer of Lafayette Conclave of the Red Cross of Constantine, a member of Ohio College Societas Rosicruciana in Civitatibus Foederatis, a past master of American Union Council 445 Allied Masonic Degrees, the very eminent preceptor of Galilean Tabernacle XXIII Holy Royal Arch Knight Templar Priests, a past master and secretary of American Union Chapel 16 of St. Thomas of Acon, a past excellent chief and treasurer of Donegal Council 94 of Knight Masons, and a member of Marietta Chapter 59, Order of the Eastern Star. Sir Knight Pugh served on the parent board of the Ohio Masonic Home and is president of the Marietta Masonic Temple Board. Worthy President Mrs. Rick Cipolla of Sheridan 131 presided at the official visit of Supreme Worthy President Ms. Kim Burnett. Tobias Churton, Invisibles: The True Story of the Rosicrucians, Lewis Masonic Publishers, 2009, 444 pages, ISBN: 978-0-8531-8-309-9.
ning the 18th and 19th centuries and in particular a presentation of how Rosicrucianism may have influenced such philosophers as Dee, Fludd, Bacon, von Hund, Willermoz, Saint Martin, Swedenborg, and organizations like the Golden Dawn, O.T.O., Martinism, A.M.O.R.C., and of course, the Freemasons and the Masonic Rosicrucians (S.R.I.A. and S.R.I.C.F.). One particular topic of interest is the authorâ&#x20AC;&#x2122;s discussion of the influence of Rosicrucian teachings in the development of the Scottish Rite 18th degree of Knight Rose Croix. The book is obviously well-researched, and the material is presented in a quite readable and in (thankfully) chronological order. Brother Churton tries to be all-inclusive with his subject matter and largely succeeds. The central question which the book attempts to answer is: did the Rosicrucians actually exist during or prior to the publication of the Fama (1614) or were they simply a chimera given birth by the fertile imagination of Andreas but nurtured and matured by like-minded individuals to become a viable entity? The book provides ample material for the interested student of Rosicrucianism to ponder this question and arrive at his own conclusions. 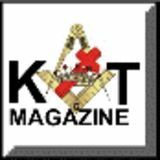 Subscriptions to the Knight Templar magazine are available from the Grand Encampment office at a rate of $15.00 per year. Individual issues in quantities of less than ten can be obtained for $1.50 each from the office of the managing editor if available. Inquire via e-mail to the managing editor for quantities in excess of ten. All past issues are archived on our web site. http://www.knightstemplar.org. Petra Jordan. Photo by Editor.